I'm not sure why camera manufacturers make camera straps so uncomfortable. I'm guessing that it's so that the straps have a grippy quality that allows them to be less likely to slip and therefore less likely to fall off of your neck and (in a second therefore), therefore less likely for your camera to achieve contact with ground (this is bad, unless you gently set it there. I once dropped my most expensive lens. That was un-fun). I have not yet developed callouses on my neck that would allow me to wear my camera strap without discomfort. Perhaps that's something that is discussed with pride among professional photographers? I wonder if they compare neck callouses? Although it would be pretty hard to see your own. You'd have to get an impartial judge, which seems like a lot of hassle for a simple callous comparison. Or you could get two mirrors. Or, I can't believe I didn't think of this earlier, you could just take pictures of each other's callouses. I'm spending way too many words thinking about something that probably does not exist. I'm unfamiliar with small talk among photographers (or their necks.) (I don't mean small talk among their necks, I just mean, I'm unfamiliar with their necks--I don't make a habit of examining people's necks; although I do enjoy vampire fiction, a preoccupation with necks has not yet resulted, apart from this blog entry). Whenever I meet professional photographers, I try to change the subject. I feel like a fraud and I don't want to get caught forgetting that my camera is a 60D or confusing ISO with aperture (it's totally happened, even though I can use ISO and aperture with dexterity if with mixed results). I've resorted to some pretty interesting solutions while trying to relieve camera strap chaffing, including wearing the whole thing down around my shoulders or under one arm. Not exactly ideal. 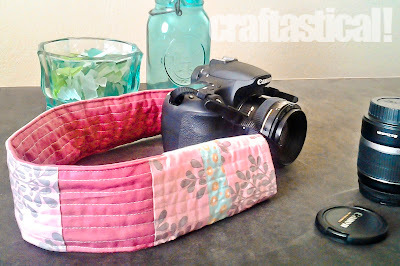 So, it's pretty sad that it took me this long to make a dang camera strap cover. I used this tutorial, which I saw on Pinterest, but between steps 3 and 4, I quilted it. Because I have issues with authority. Plus, quilting is fun. It's a great tutorial and super easy to follow. Hopefully I don't make any gymnastic moves that will allow my camera to somehow slip off my neck. I doubt it. I feel pretty safe about it. Plus, it's squish and soft, I made it all out of scraps, so it was free, I really like pink and aqua, and I have a place for my lens cap other than my back pocket. Rock on. 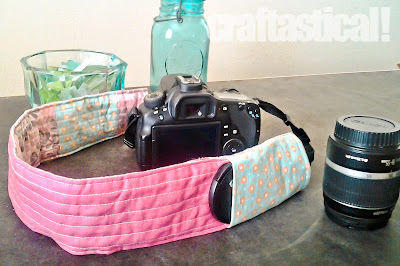 Your pink and aqua strap looks comfortable once it is around your neck. 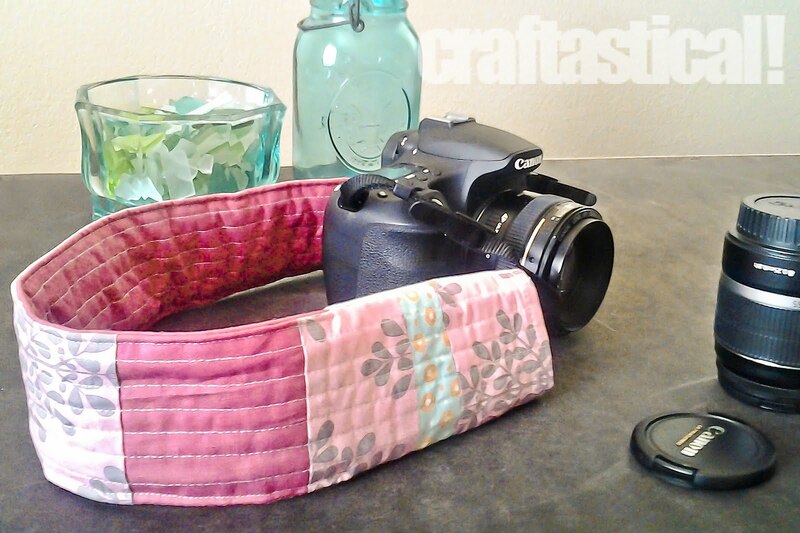 This strap is great when you are trekking around with the camera slung to your side.I just hope the material lasts through sweat but it's pretty nice!